In the late 1950s, Florida’s Walton County Health Department, hoping to offer midwifery care to low-income African-American residents, arranged for Gladys Milton to be trained in Alabama. After she received her midwife license in 1959, she attended her clients at home until 1976, when she opened Florida’s first birth center, now named Milton Memorial Birthing Center. By this time, most Grand midwives of the South had been forced out of practice. Those that remained provided care for poor, rural women, unacknowledged by local health departments. When middle-class women began to lobby for midwife licensure in the early 1980s, the state of Florida took notice of Gladys Milton and attempted to phase her out. The “home birth renaissance” enabled Gladys Milton to not only stay in practice, but to become the first traditional Grand midwife to be professionally licensed under the new law in 1984. Gladys Milton attended more than 3,000 births in her long career. Her legacy continues through her daughter, Maria Milton, continuing the family tradition as a midwife at Milton Memorial Birthing Center. Gladys passed away in 1999 at the age of 75. 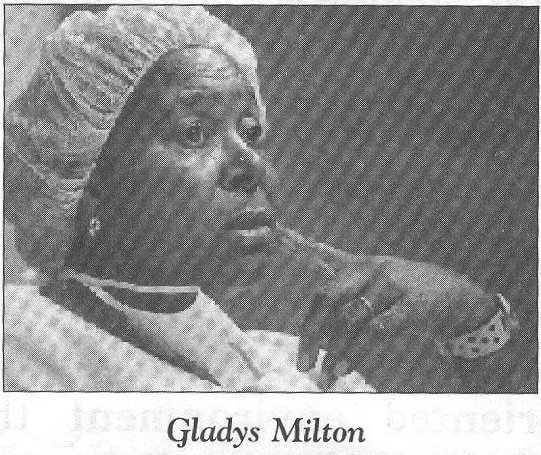 To learn more about Gladys Milton, visit http://miltonmemorialbirthingcenter.com/id6.html.